Former Derry senior hurling manager Collie McGurk. Derry are in search of a new senior and Under 21 hurling managers after Collie McGurk stepped down from his dual role. 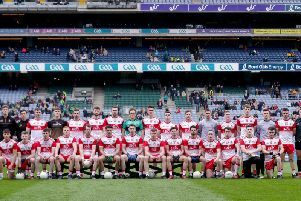 The former Lavey star was appointed to succeed Tom McLean in November 2016 and guided the county's under 21 to the Ulster title last year when they defeated Down 3-17 to 1-09 in a memorable final . At senior level, McGurk guided the Oak Leafers to 2017 Nicky Rackard Cup glory against Armagh in Croke Park before taking them to this season's Christy Ring semi-finals where the lost out to Kildare 3-18 to 2-13 in Inniskeen. "Derry GAA wish to confirm that senior hurling manager, Collie McGurk, has stepped down from this position, with immediate effect," read a statement from the Derry County Board. "We would like to sincerely thank Collie, his management and backroom teams, and all the players who have represented their county during this period. "Nominations for the position of Derry senior hurling manager will be sought from our clubs in the coming weeks." As a dual player, McGurk won four Derry Senior Football titles and helped Lavey to the All-Ireland Club title in 1991. He was also in the Derry squad that won the county's only ever Sam Maguire back in 1993.